Mushin Arts is a skill tree in Sekiro: Shadows Die Twice, this skill tree focuses on unlocking a set of moves that are upgraded, and stronger versions of each tree's ultimate ability. Players will need to unlock prerequisite skills in order to gain the listed skills in the Mushin Arts Skill Tree. 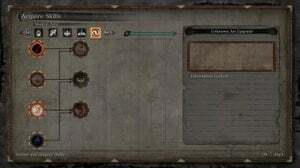 Each Skill Tree consists of a variety of skills that are categorized as Combat Arts, Shinobi Martial Arts, and Latent Skills that will allow players to alter and customize Sekiro's overall effectiveness in combat and survivability. This can be obtained by completing a quest from Tengu of Ashina, then upon mastering the final skill of any skill tree, he will provide you with the Mushin Esoteric Text that contains the skills of the Mushin Arts. You will need to finish the Ashina Castle Genichiro fight for him to move to the Serpent Shrine Idol in Ashina Castle. After Tengu leaves his second location it can be acquired from Isshin Ashina. If Isshin dies, Emma will be at his body in Kuro's room and will give the Mushin Esoteric Text as long as the requirements were met. Mushin Arts require skills of other arts to unlock. Yo, just keep going through the game. Emma gives you the arts, not him. Uh in my game a miniboss is where he was at Snake temple, and my current boss is Emma? So now how do? Cloud passage unlocks after you trade in carp scales for a scroll at the hirata carp dealer. You can get it regardless of which final tree skill you learn. I had the last one of the prosthetic tree, and I still got it.